I recently purchased a 2006 with about 150K. I put a decent set of tires on it and had it aligned. The shop has aligned my other Taurus and done a good job. They were able to adjust toe in but had a problem with the camber on the passenger's (right) side. They adjusted it as much as possible and could not get it within specs. It's well over one degree off - too much negative camber. Probably due to some damage in the past. The car drives OK but I'm concerned that tire will wear quickly. These car are not worth much any more and I'm reluctant to spend a lot of money having the frame adjusted. Is there any other way to get more camber adjustment? Drilling the strut tower may help. Dunno if camber adj. bolts are available for this application or not? Your alignment shop couldn't adjust the camber because it is not adjustable unless you drill out the strut tower plate spot welds or shifting the whole subframe. If they have drilled out the spot welds and ovaled out the tower holes then there are two more options. First is to install new quickstruts because of sagging springs or second if the other side is cambered the other way they subframe could be shifted to get a better camber. You shift the subframe by loosening the four subframe bolts and move it and retighten the bolts. Right, there is no factory provision for adjustment. What they did and on my other Taurus as well, they drilled out the spot welds and slotted the bolts a little. They did both sides on my 2004 and it worked well. The 2006, they did the right (passenger's side and moved it as much as possible but could not get enough adjustment. 1. Sheila, you mention some type of offset bolts? Any idea where I could track something like this down? 2. Automender, I thought about trying to adjust the sub-frame. I could push it as far as possible to the left side of the car which would improve the negative camber on the right side. The left side has not been drilled and adjusted so I could probably get that back in spec by drilling and adjusting. Without modifying the sub-frame do you think I will get much adjustment that way? Quick-struts are a possibility. They increased the ride height of my other car by about 1/2 inch which may improve things a little. I sure wish I hadn't given my old struts away, probably could of thought of some way to offset the mounting bolts. THanks, appreciate the ideas. If I can come up with a good fix I will document and post the results. Camber Adjustment Plates Will These Solve My Problem? 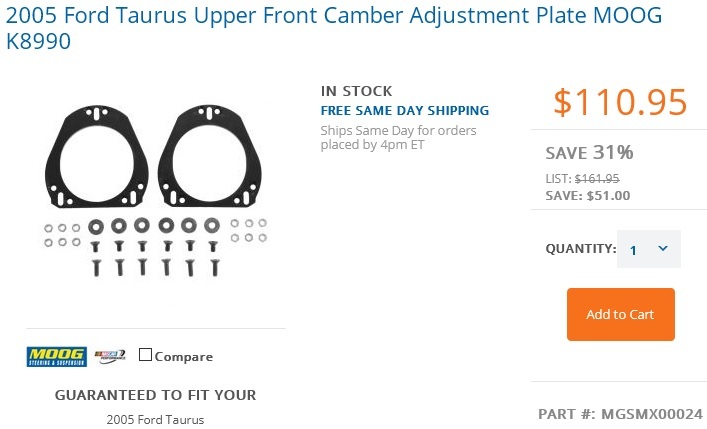 Do you think these camber adjustment plates will solve my problem? How much adjustment do you think I can get with these? Personally I think it is the same as cutting the top plate loose. The bolts of the strut still have to go through the tower holes that they slotted.